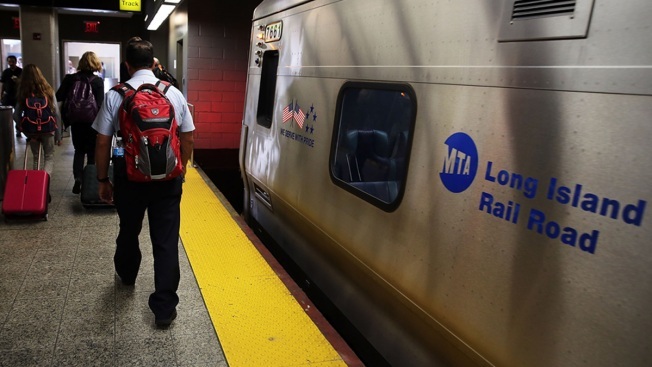 Long Island commuters trying to head home were met with massive transit problems Tuesday evening after a pair of mishaps during the evening rush left service suspended on three Long Island Railroad lines and access to Penn Station restricted for more than an hour. Service has resumed on the Ronkonkoma, Port Jefferson and Oyster Bay lines about 7:30 p.m., nearly two hours after a pair of vehicles on the tracks left thousands of commuters crowding into Penn Station and other stops along the nation's busiest railroad. But the MTA says that commuters should still expect delays; as of 7:45 p.m., they were topping 90 minutes. At one point, overcrowding at Penn Station got so bad that MTA police restricted access to the station's entrance at West 34th Street and Seventh Avenue. The stoppage comes after a pair of vehicles on the tracks. A train got stuck on the tracks near Mineola, suspending service on all three lines east of Jamaica station. And service on the Ronkonkoma branch was additionally suspended after a vehicle was hit by a train near Wyandanch. It was not clear if anyone was injured.